The KRI Teluk Lada (521). The Indonesian Navy (TNI-AL) recently commissioned the fourth ship of the Teluk Bintuni-class landing ship tank (LST), the KRI Teluk Lada (521). 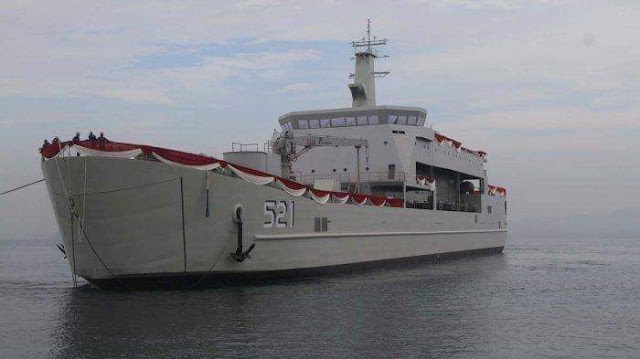 The ship will be assigned with the TNI-AL’s 3rd Fleet Command (KOARMADA III), the fleet in charge of naval operations on the eastern side of the country. It has a maximum speed of 16 knots with a maximum range of 6,240 nautical miles at 13 knots cruising speed.. It has a helicopter landing pad and hangar for 2 helicopters and can carry up to 10 Leopard 2 main battle tanks, which is the standard main battle tank of the Indonesian Army.